The new iPad was unveiled by Tim Cook with much fanfare. However, it is hard to tell that anything special had been changed for the tablet. Apple even did not give it a number in its name this time, and most viewers are still calling it as the iPad 3. Apple says, “To make that hands-on experience even better, we made the fundamental elements of iPad better - the display, the camera, the wireless connection. All of which makes the new, third-generation iPad capable of so much more than you ever imagined”, but it seems the new iPad 3 does not satisfy those who would like more. Anyway, we have to admit that one big "improvement" of the new iPad is the screen, in specifications, the iPad 2 has 1024x768 pixels resolution on a 4:3 9.7-inch screen, giving it 132 pixels per inch (PPI). The new iPad has 2048x1536 pixels resolution at 264 pixels per inch (ppi), giving it four times as many pixels. Thus users are able to expect a much clearer experience when reading a book, viewing a movie, watching photos, and playing games. Apple points out that the new iPad 3 now supports playback of H.264 video up to 1080p, 30 frames per second, so it’s good news for those people who would like to copy their purchased Blu-ray to the new iPad 3 for viewing on the go. A quick guide: How to rip 1080p Blu-ray movies to play on iPad 3? 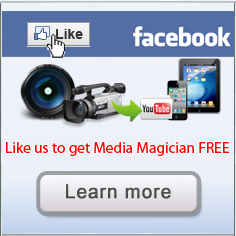 Pavtube Blu-ray to iPad 3 converter (If you are running a Mac, please try new iPad 3 Blu-ray Ripper for Mac). In addition to ripping Blu-ray DVDs to iPad 3 1080p video, Pavtube Blu-ray to iPad 3 converter also helps Apple devices owners watch blu-ray movies on ipad 2, rip Blu-ray to iTunes 1080p, rip DVD for iPad 3, play/watch dvd movies on iPad 2, and enjoy Blu-ray and DVD movies on iPad. You can directly load your Blu-ray disc into the program from your BD Drive, or from the Blu-ray folder or a Blu-ray ISO image file stored on your computer’s HDD. 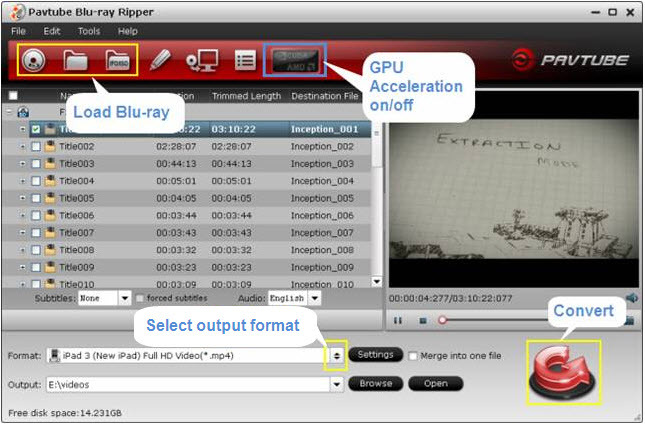 Note: Pavtube Blu-ray to iPad 3 Ripper is able to make full use of GPU acceleration technology (NVIDIA’S CUDA and AMD APP tech) to largely speed up the Blu-ray ripping process when using h.264 codec. If your computer is running on a CUDA/AMD APP-enabled graphics card, the program will detect and enable it automatically. Generally speaking, the Blu-ray ripping speed can be accelerated up to 6 times faster than ever. Note: By using the above mentioned audio and video settings, you can easily rip and convert 1080p Blu-ray disc/Blu-ray ISO to the new iPad 3 for playback with 1080p quality reserved. Simply click “Convert” button to rip Blu-ray for new iPad 3. When the Blu-ray to iPad 3 ripping is completed, you can add the output mp4 files to iTunes for the new iPad 3 synchronization. This is a workaround for the new iPad users to stream/transfer/play Blu-ray movies to/on iPad 3.